In the end what once caused us pain and tears becomes the source of great interior joy, since we have realised how these things help in our spiritual progress. COMMENT: It is true, as Fr Doyle says, that things that were once disagreeable to us can become a source of peace in our lives. 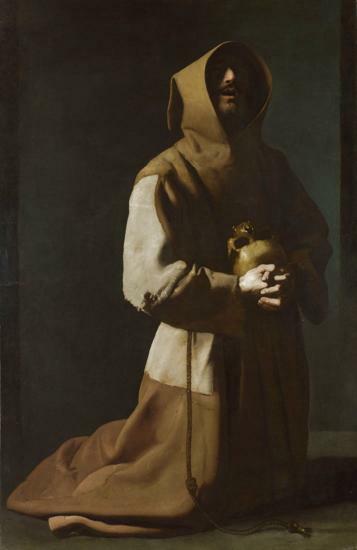 We can see this in today’s saint, Francis of Assisi, who, as the son of a rich merchant, had many pleasures available to him but chose to abandon this luxury to embrace a life of extreme poverty and penance. The deprivation that would have caused the young Francis much pain became a source of joy as he matured into great sanctity. Like St Therese of Lisieux, modern piety does a great disservice to Francis, presenting him as a type of medieval environmentalist and peace activist, and downplaying other aspects of his character. Sanctity is always well balanced. It calls us to love justice and peace AND to hate vice and overcome it; it calls us to respect animals and the environment AND to radical conversion and serious apostolate. Despite first impressions, there are many similarities between Fr Doyle and St Francis including an ardent love for souls, a desire to go on the missions, an openness to martyrdom, great asceticism and a passionate love for Christ. One of the pivotal moments of St Francis’ life was when he heard Christ calling to him to rebuild the Church which was falling into ruin. The Church faces ruin in every age, and always from the same sources – the compromises and unfaithfulness of Her members. St Francis’ remedy was not to boycott the Church or to seek to change its teachings. He chose the harder, and more heroic route of personal reform. His example changed the face of the earth and bequeathed numerous saints to the Church. The path for the renewal of the Church today is exactly the same – real personal renewal which will allow us to preach the Gospel constantly, but by our example rather than by words, as Francis urged his followers.